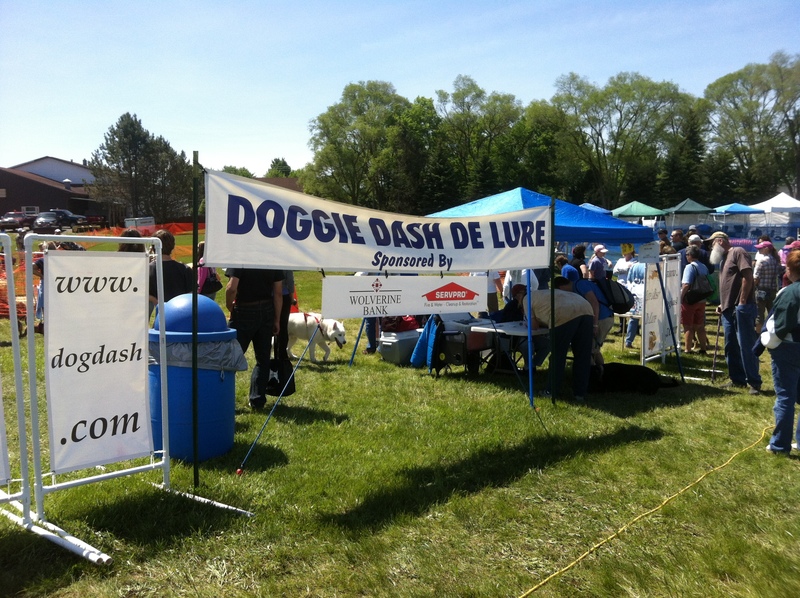 It is an event just for dogs and the people that drive them there. I’ve been going for a lot of my life every year starting with last year. There are lots of people and lots of dogs. 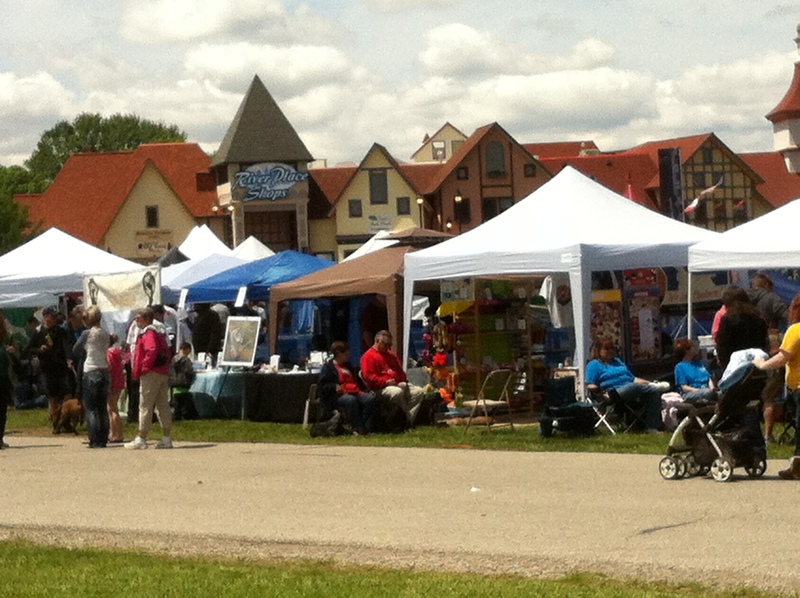 It is held in Frankenmuth, Michigan. And it was a really beautiful day, about 60 degrees out. I did really well last year. This year I had a nutty in the car. I just got so excited I started barking. I rolled my eyes back in my head and jumped around and jumped out of the car several times in the parking lot because there were other dogs nearby. I love other dogs. Or I am afraid of them. I’m not sure which sometimes. Their people were afraid of me and they scooped up the little ones they could carry away because they probably thought I was mean or something. People with big dogs made them walk away from me. We parked in a field. We had to walk from the car to the sidewalk. That took about 15 minutes because we had to start over every time I threw my body at another dog, which was a lot. Mom was very patient and didn’t let me get away with anything. Then we walked a long way to the actual Dog Bowl on the sidewalk with other dogs. Every time I pulled Mom’s arm out of the socket, I got a leash correction and we did an about-face. It was really crowded so sometimes we just got out of line, circled a tree and got in line behind somebody else and their dog. By time we got the actual Dog Bowl (place, not dish) I was calming down. I stopped throwing myself at the other dogs and just leaned a little to sniff. Mom was more happy. Me too. First stop was the play area. I sat and waited for Mom to open the door. Then I trotted right in politely. I got to run around without the leash and meet all the other dogs. They smelled GREAT! I didn’t bark once. I fetched and chased, and peed on some of the plastic furniture because other dogs did before I got there and I thought that was OK. Mom yelled really loud. Now I know to hide so Mom can’t see me do that. I also tried to climb into a lady’s lap. She was very surprised. Mom apologized. Poor Mom. It’s not OK to try to climb onto the picnic table either. Mom shot me with the hose. (For “fun” not because I tried to get on the table.) She said I could go in the wading pool, but I didn’t want to. I got slimed by other dogs. It was way fun. And then we left. 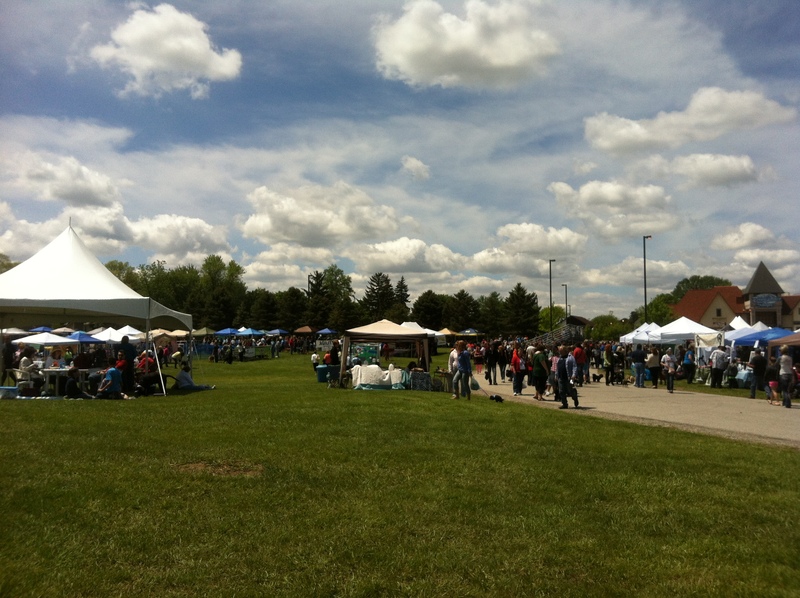 We walked around all the booths past hundreds of dogs. I was VERY GOOD. We met a lady with a painted poodle. You’ll want to click the picture to see her bigger. She was very strange, but very beautiful. I forgot her name. Mom asked the lady if I could pose for a picture with her and I did. Mom said I looked like a typical male when a pretty girl goes by. I’m not sure what that means, but Mom giggled when she looked at the picture and I like hearing her giggle. Later we saw her again with her purple friend who had red painted toe nails. Mom said I shouldn’t worry because I will always be a blonde. We walked around some more and saw other dogs. 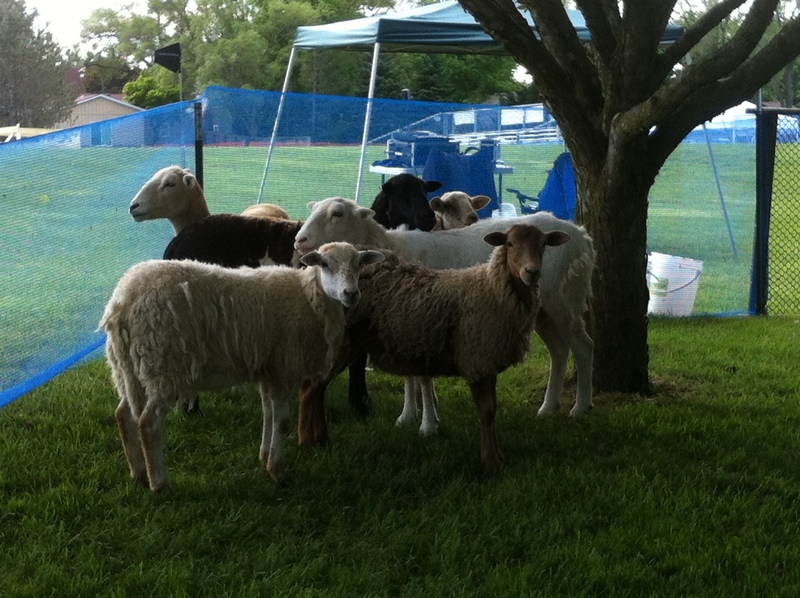 Mom said they were sheep. They did shows with black and white dogs that ran at them and moved them around the big field that “regular” dogs like me were not allowed in said Mom. They are resting in the picture after being chased. I think they thought I was very handsome which is why they are all staring at me except the two in the back that are nearsighted. Mom said we might go back tomorrow if her arm feels better and if I promise not to have a nutty. I’m getting kind of sleepy now so I’ll say so long. Or, “sew” long. (Quilting humor. I know who buys the kibble.) Love you, Mom. 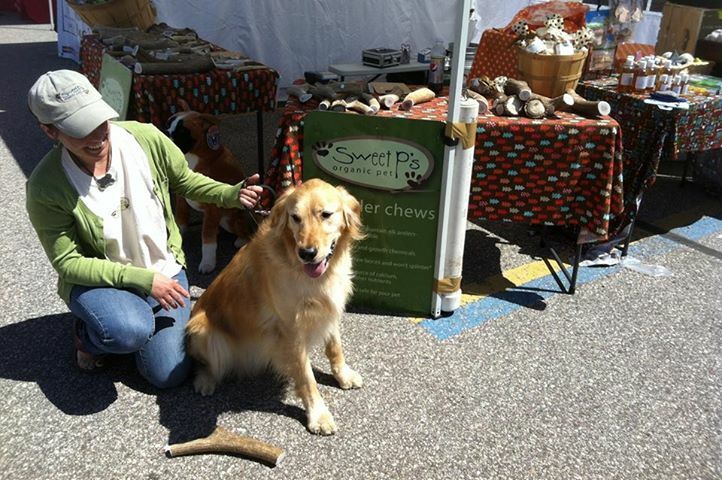 More fun than that was a stop at Sweet P’s Organic Pet booth. We went their last year when I learned all about elk antlers. They are safe for dogs, taste great, clean my teeth, and don’t stain the carpet. I just can’t drop them on Mom’s feet because she doesn’t like that. We are home now. I need a nap. Scutter: Thanks for the peek into your day. You really hang out with some flashy babes. Tag, my dog, only went down to the river. No other dogs for him to pal around with. I am not sure he would be as good as you are in a crowd. 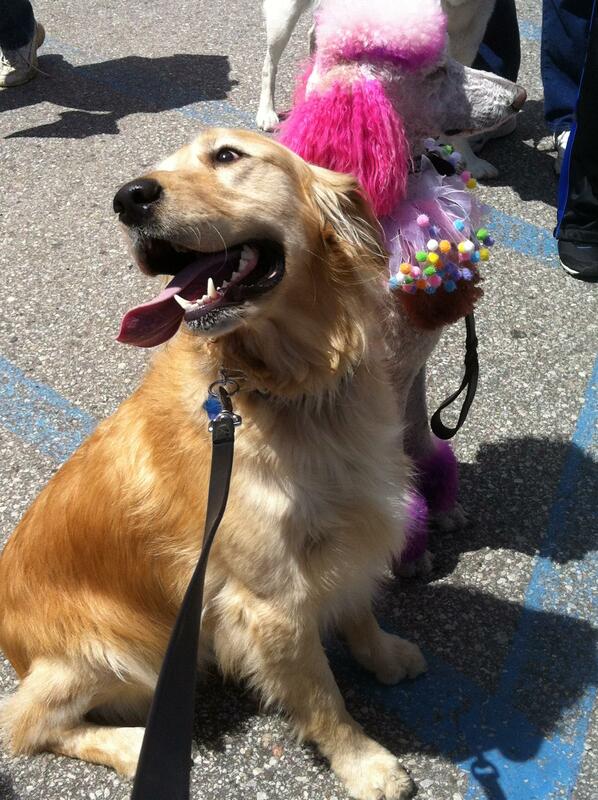 I had a great time meeting all the other dogs. I would like going down to the water too. I’ll ask Mom if they have some. I’m OK if we just hang out with the babes too. Good boy, Scooter. A few more thousand about turns and your Mom will take you out more often. And it’s true, all sheep think Goldens (especially you) are very handsome because they have good taste. I’m thinking sheep may taste good too, but Mom wouldn’t let me check. I LOVE it when Scooter Blogs! Thank you, Mom and Scooter!! Then could you scratch my belly please? Oh Scooter, what a FUN day you had. 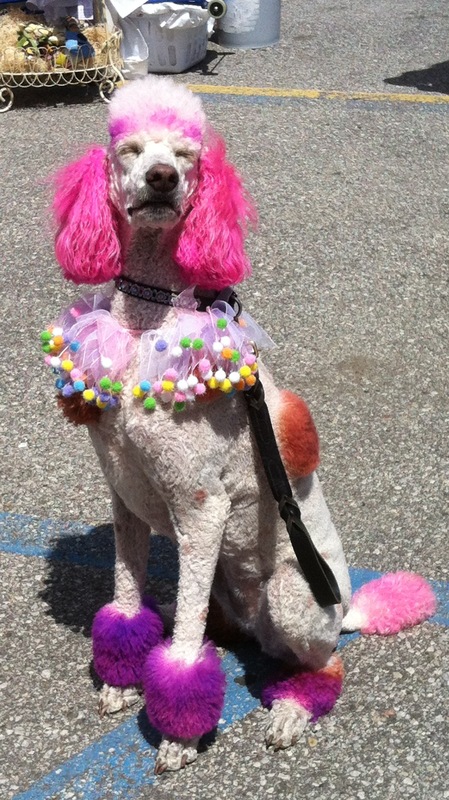 I am unsure if the painted poodle is your type, but it doesn’t cost to look. Hope your mom’s arm is not sore so she can still stitch. My mom sews too, but since I’m a cat, I always like to lay on her quilts in progress. I wish there was a cat bowl in Michigan, but I probably won’t go as I detest riding in the car. I’m pictured in her quilt project on her blog. Thanks for your post! 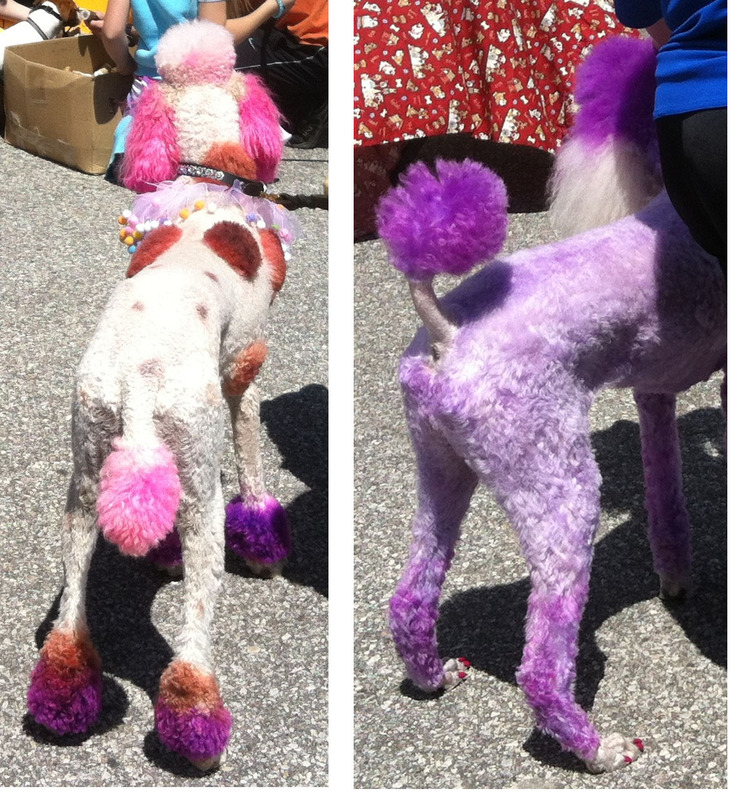 The poodles sure were pretty, but I don’t think they were as interested in me as I was in them. But I made lots if new friends. What a wonderful day scooter, you write so well, I feel like I was there. Hope Mom takes you back again. Thank you, Cher. We did go back. I just added two more pictures at the bottom. Scooter, tell your mom to be sure to alternate hands holding your leash so one arm doesn’t get longer than the other. Belly scritches and hugs to you! It takes both hands. They are equally stretched now. Scooter, you are such a character. I mean that with a LOT of love and affection. I think you just might benefit from a session with the “Dog Whisperer” when it comes to your nutty attacks. It certainly would save you mom’s shoulders and arms. You really gave her a workout at the dogbowl. Did you get the painted ladies phone number for a play date? They sure were all gussied up. I would like to meet the Dog Whisperer. Or the psychic lady with the tight leather outfits and the boots (is she still around?) because I would like to get cured. Scooter, you are so funny. It sounds like a great day for you and mom!! We had a load of fun. This blog entry made my day…I love dogs, have 2 of my own…to read about a day in the life of a dog from the dog’s perspective is always a treat!!!! I think it makes more sense coming from a dog’s perspective, plus Mom appreciates the time off. Scooter is the best. Well except for the nutty in the car. I like scooter’s mom too. She seems like a very patient lady. I’m sorry about the nutty in the car, and the several more nutties today. I just can’t help myself. I will try harder. Hi Scooter ..Just love hearing from you, glad you had a wonderful day. By the way you handsome devil ….don’t think those flashy poodles were good enough for you!!!! Thank you, Jeannette. I think those poodles spend more money on their groomer than Mom does at the quilt shop. We have our priorities straight. Looks like a fun day, nice of you to give Mom a day out, Scooter. Too bad about your ‘lady friend’ who was forced to shed all her dignity by wearing that goofy outfit and dye job. I think she liked it. I like her. Poodles usually want to bite me for some reason, but not her. We went back. She wasn’t there. Ami (Mom), Thanks for the play-by-play. DH is so allergic to …Everything… I must enjoy others’ pets rather have one of our own . I am esp. fond of ScooterPie. Thanks for sharing him with all of us. Thank you Wanda. I am allergic to something too, we just don’t what it is. It might be myself. Can dogs be allergic to dogs? Hi, Scooter, Ellie here. It sounds like you had a LOT of fun on your outing. My Mom takes me to the park, but it’s really quiet. I don’t see too many other dogs so I don’t have to do as many about-faces. Today I saw a teensy-tiny little dog. My mom asked if she was friendly and the dog’s mom said no, she might bite your dog. I wasn’t really worried. I’m 87 pounds and that dog couldn’t have weighed more than 5 pounds. Another opportunity to play lost…PS: Keep writing. I like the dog stuff! Thanks, Alicia! I think Mom is cute too, but I am cuter. It’s a dog thing. What an adorable story. I thought I was the only one with a nutty puppy. Nutty puppy VS dog having a nutty. Hmmmm….